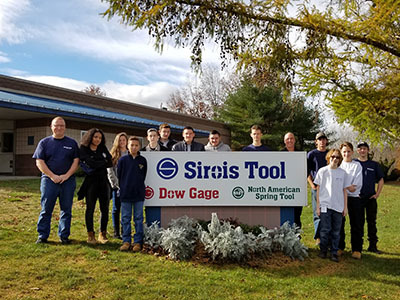 Sirois Tool Supports Future Manufacturers – Sirois Tool Co., Inc.
On November 14, 2018 it was a great pleasure to host a Phase 2 Freshman Exploratory Facility Tour for a small group of students. They were accompanied by Mr. Hood, the Precision Machining Department Head from Vinal Technical High School located in Middletown CT. The tour was provided to educate the students about manufacturing so they will be able to make a more informed decision when they go through career selection. A group of Sirois Tool employees had the chance to speak with the students before they got to see behind the scenes of a job shop. The group included: Alan Ortner, President; Andre Nadeau, Operations Manager; Scott Horton, Production Manager; Cheryl DiPinto, Human Resource Manager; Dane Hoeffer, Quality Manager, 2 of our Vinal Tech graduates, Raymond and Timothy and one of our current Vinal Tech seniors, Ian. We had a chance to talk to the students about different opportunities, the benefits of manufacturing careers, skills needed and how some of us ended up in our positions. Our Vinal Tech students each talked about what’s expected in Mr. Hood’s class, some of the great things that they had the ability to do and what they made while in class. We talked to them about the Work-based Learning Program and being able to work for a company during shop cycle time. The students then got a chance to tell us a little about themselves, what they wanted to do and why. At the time of the tour the students were guided through each department and we explained what each area of the facility did and why. They also had the opportunity to touch and examine some of the parts that we make, which provided them with a door to ask questions about the machines and materials used to make the parts. There were several students that seemed to like what they saw and at the end of the day, hopefully we encouraged the students to consider manufacturing for their future career path. It is critical to educate today’s young adults and parents about the benefits of working in the field of manufacturing to grow the future workforce. Sirois Tool Focuses on Retention to Help Exceed Their Customers’ Needs Happy Holidays! Employees generously donate to local charity.